The United Hospital Fund paid tribute to Howard P. Milstein, Arnold P. Gold, M.D., and Stephen Berger at its annual gala, held at the Waldorf=Astoria Hotel, recognizing their invaluable contributions aimed at improving health care in New York. Drawing a crowd of more than 550 health care, business, and community leaders, the event marked the opening of the Fund’s 137th fund-raising campaign for its work to shape positive change in health care in New York. Howard Milstein, chairman of New York Private Bank & Trust and chairman of Milstein Properties, received the Health Care Leadership Award. On the board of Weill Cornell Medical College for almost 30 years, he is helping to spur progress in some of the most complex areas of science and biotechnology. As board member and, for the past 15 years, chairman of the New York Blood Center, he has provided visionary and results-oriented stewardship for decades. Acting on an equal concern for better prevention and treatment of skin cancer, he has served as chairman of the American Skin Association since 2003, sharpening the organization’s focus on melanoma and other cancers. And he has been a valued member of the United Hospital Fund board since 2005, with a particular interest in UHF’s work with New York-area hospitals to improve the quality of care and patient safety. The Health Care Leadership Award was established by the United Hospital Fund in 1998 to recognize strong and sustained leadership aimed at improving health care in New York City. Previous recipients of the award include Michael A. Stocker, M.D. ; Peter May; Frank A. Bennack, Jr.; Kenneth Raske; James and Merryl Tisch; Anthony Watson; Martin D. Payson; John K. Castle; Mathilde Krim, Ph.D.; Sanford I. Weill; and Maurice R. Greenberg. Arnold P. Gold, M.D., founder of The Arnold P. Gold Foundation, received the Distinguished Community Service Award for launching what is now an international movement that is changing the culture of medical education and practice, and making a profound impact on thousands of health care professionals and the patients and families for whom they provide care. Stephen Berger, Chairman of Odyssey Investment Partners, was recognized with a Special Tribute for his impassioned, intelligent public service aimed at advancing the goal of better health care access for all. He is a member of the Project Approval and Oversight Panel for DSRIP, the Delivery System Reform Incentive Payment program, guiding New York’s investment of $6 billion in federal funds, through the State’s Medicaid waiver. The United Hospital Fund is a health services research and philanthropic organization whose primary mission is to shape positive change in health care for the people of New York. For more information, please visit www.uhfnyc.org. 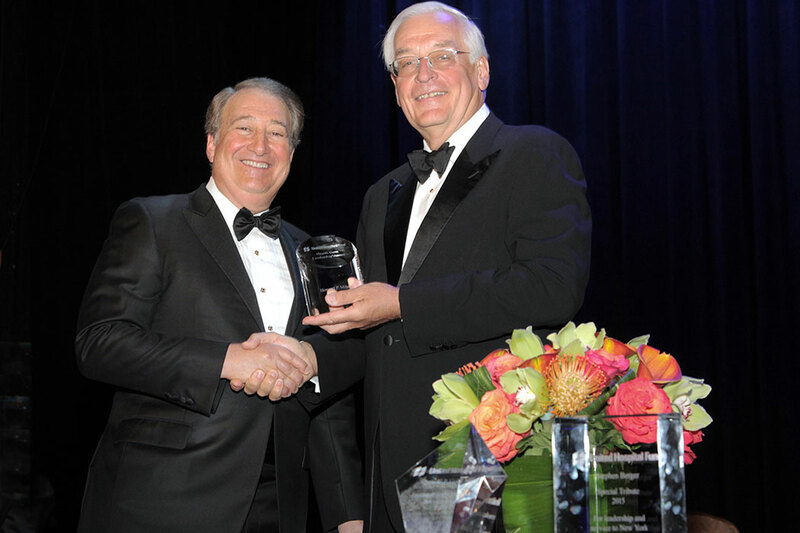 J. Barclay Collins II presents the United Hospital Fund’s Health Care Leadership Award to Howard Milstein.